Some of the healthiest foods can lead to intestinal gas and flatulence. This is largely due to their fiber content. Your digestive tract has a difficult time breaking down substances like fiber and other carbohydrates, so they eventually pass into the large intestines. Once undigested foods move into this section of the digestive tract, bacteria takes over to help aid in digestion, leading to intestinal gas. Though garlic is relatively low in fiber and other carbohydrates, it does contain starches that the body has a difficult time digesting. These starches are passed from the stomach to the small intestines before moving into the large intestines where the bacteria can start breaking down the undigested parts of the garlic. As the bacteria breakdown the starches from the garlic, they create a byproduct in the form of gas. This gas is largely made up of hydrogen and carbon dioxide. 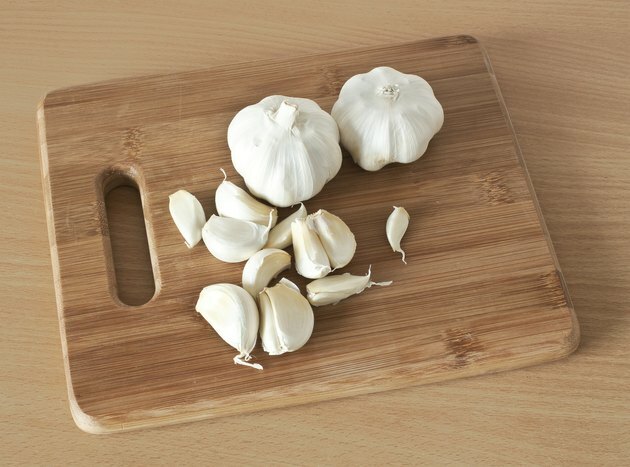 However, the International Foundation for Functional Gastrointestinal Disorders explains that garlic is odor forming when it comes to intestinal gas. This means that the bacteria also release methane, which can give flatulence a foul odor. While gas and flatulence doesn't require treatment, it can be uncomfortable for many people, especially when it's accompanied by an odor. If garlic tends to increase your gas and flatulence, avoid foods made with this ingredient. There are over-the-counter treatments for gas, including medications containing simethicone or charcoal. According to the American College of Gastroenterology, there is little evidence that these medications efficiently reduce gas. Before you take any medication for gas, talk to your doctor. Besides avoiding foods containing garlic or taking an over-the-counter medication known to reduce intestinal gas, you may also want to avoid foods high in fiber, which can encourage the production of gas. Eating more slowly may also limit the amount of air swallowed during meals, explains MedlinePlus, which can also decrease the amount of gas in the digestive tract. Even exercise can help reduce gas and subsequent flatulence in some people.